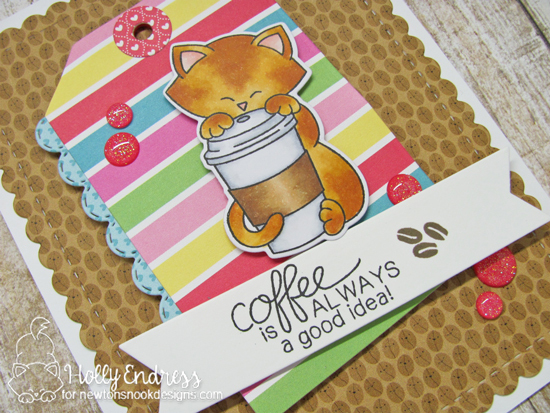 Hollybeary Creations : Coffee is always a good idea!! Coffee is always a good idea!! Happy Tuesday everyone! I'm over on the Newton's Nook Designs blog today with a card featuring the adorable Newton Loves Coffee set and coordinating dies. I also used some of the Cute Cream and Sugar papers from Doodlebug Designs. I created an A2 sized White card base and then I added a layer of the pattern paper that I die cut with the Frames and Flags Die set. I created a tag using elements from the Fancy Edges Die set. I stamped Newton onto some X-Press It blending cardstock and colored him in with Copics. Then I used the coordinating dies to trim him out. I adhered the tag to the card with some Fun Foam so it didn't have a lot of height. Using the Frames and Flags die I die cut a banner and stamped the sentiment and some of the coffee beans onto it. I adhered the banner and Newton to the tag with some foam tape. I wanted a little pop of sparkle and some extra Pink so I added some of the Valentine Sprinkles from Doodlebug Designs. This is a great set to have in your stash for any occasion and I love how well the Tag and Frames die sets work together. It's always fun to step away from the Distress Ink and play with pattern papers! Head over to the Newton's Nook Blog for more great inspiration from the team!! And be sure to check out the retirement sale going on in the store now, you don't want to miss out on some great sets at a great sale price! So adorable! 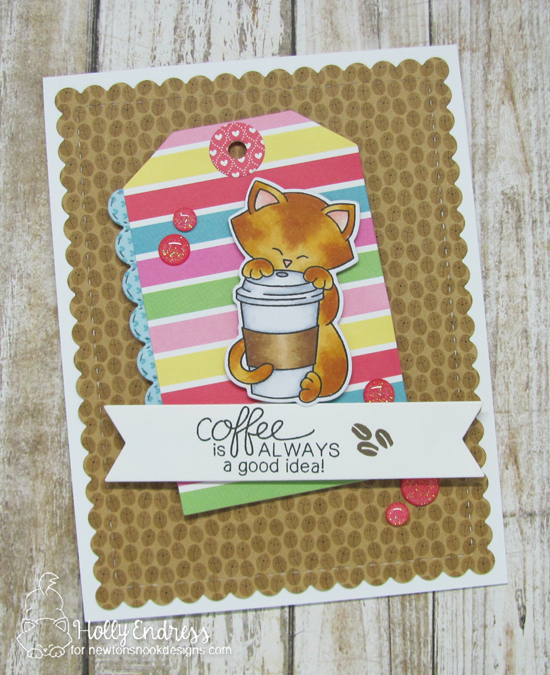 This card is PURRfect for a coffee lover! The use of the tag die is awesome too!